When you graduate with your bachelor’s degree, you want to earn a good salary. Learn which Oregon school is the best college by alumni salary. 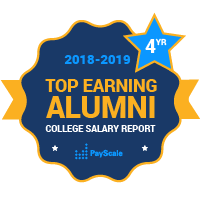 There are a number of colleges and universities in Oregon included in PayScale’s College Salary Report. Some of the most notable colleges in Oregon are Oregon State University (OSU), University of Oregon (UO), Portland State University (PSU), and the Oregon Institute of Technology (OIT). In the first five years after graduation, Oregon Health and Science University (OHSU), located in Portland, is a Oregon college with some of the highest-paid graduates with a bachelor’s degree only. OHSU produces lots of nurses and other healthcare workers who are in high demand right after graduation. But a tiny, super liberal private school often produces the highest-paid graduates overall: Reed College, also in Portland. About 25 percent of degrees from Reed are in STEM subjects — that’s a high statistic for a liberal arts school. Phil Knight is just one of the famous alumni to graduate from an Oregon colleges. Other notables include: Esera Tuaolo (NFL), stem-cell pioneer Ann Kiessling, actor Mark Dacascos, and actress/painter Ariana Richards (of Prancer and Jurassic Park fame). The rivalry between Oregon State University and the University of Oregon is called the Civil War. And while the OSU vs. UO rivalry generally applies to sports and school spirit in general, when you pit the Ducks and Beavers against each other in terms of earning potential, the OSU Beavers win by almost $10,000 per year. The largest employers in Oregon are Nike Inc, Hewlett-Packard, Intel Corp, as well as several hospitals and universities.